"Patriots & Immigrants" - Now Available !! 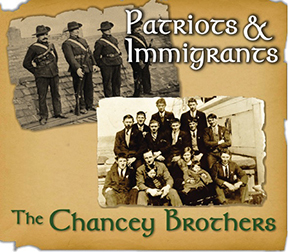 Get "Patriots & Immigrants" - our latest, critically acclaimed, chart-topping CD. Download online at iTunes, Amazon and Google Play, and other purveyors of fine music. An acoustic blend of Irish folk, rock and country music. Featuring guitars, vocals, mandolins, fiddles, flute and whistle, the Chancey Brothers perform regularly throughout Chicagoland and the Midwest making fans and friends wherever they go. In true Irish fashion, it's all about the laughter and song. Come join the party! The Curragh - Irish Sunday Fun Day!